How Warm Is Solar Pool Heating? | Solar Living, Inc.
A typical solar pool heating system can be installed in one to two days, and will provide your family with pool temperatures of over 80 degrees from mid-May to mid-September. Solar pool heating systems are environmentally friendly and very cost effective. Most systems pay back their initial cost in two to three years when compared to the installation and operation of a gas, oil, or electric heater. These systems require no routine maintenance and can maintain pool temperatures about 15 degrees warmer than without a heater. Most of our customers reach pool temperatures in the low 80's within ten days of opening the pool in the Spring. The chart to the right illustrates the impact that a solar pool heating system has on daily pool temperatures. As part of a science project, the son of one of our customers kept track of daily temperatures of three identical pools in the same neighborhood for an entire summer. The bars represent the number of days each pool was within a specific temperature range. The number of days that the solar heated pool was at temperatures of 80 or above is almost double that of the other pools. 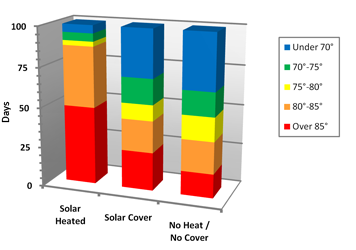 It is interesting to note that the use of a solar pool cover has a very small impact on pool temperature. Incidentally, the young boy got an "A" on his science project. Our company has been in the business of providing solar energy services for over 30 years. We can provide parts and technical support for the do-it yourselfer, or complete installations that can get you in warm water in just a few days.